If you click on one of my recommended item links and then place an order through Amazon, I receive a small commission on that sale, at no extra expense to you. Delicious and easy to make, this interesting vegetable side dish also works well cold the next day in a salad, in sandwiches or in eggs. Preheat oven to 4oo degrees. In a large bowl or a large Ziploc bag, mix pesto and balsamic vinegar. Remove stem and seeds from peppers and slice into 1 inch wide slices. Place in large bowl or ziplock bag with pesto. Stir until peppers are completely covered. 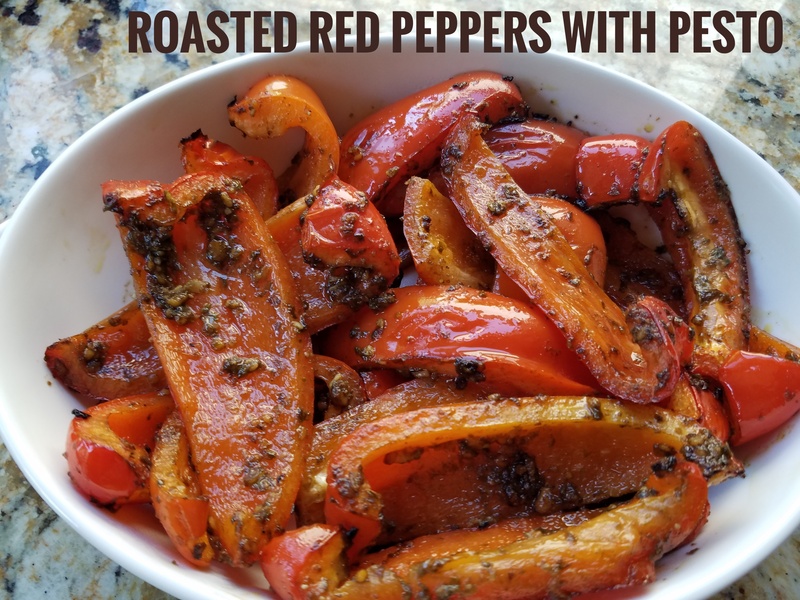 Place pepper slices on a foil lined baking sheet and place into oven. Bake for 15 minutes or until peppers are tender. This entry was posted in Recipe and tagged healthy vegetable recipe, preprep meal;, recipe; vegan; vegetarian; health by Maria Faires. Bookmark the permalink.